If your dog has been diagnosed with an inflamed pancreas, she will need a canine pancreatitis diet. This diet will help the pancreas recover and reduce the possibility of a recurrence. Pancreatitis is an inflammation of the pancreas, an organ which is part of the digestive and endocrine systems. The inflamed pancreas begins producing too many digestive enzymes. The condition can be painful. It is classified into two types: acute, which has a sudden onset, and chronic, which is a continuing and recurring inflammation. Pancreatitis ranges in severity between mild to life-threatening. The mild acute form may have little lasting damage. Other acute forms can be very dangerous. Early treatment can greatly reduce the damage to the internal organs. Left untreated, pancreatitis can be life-threatening. 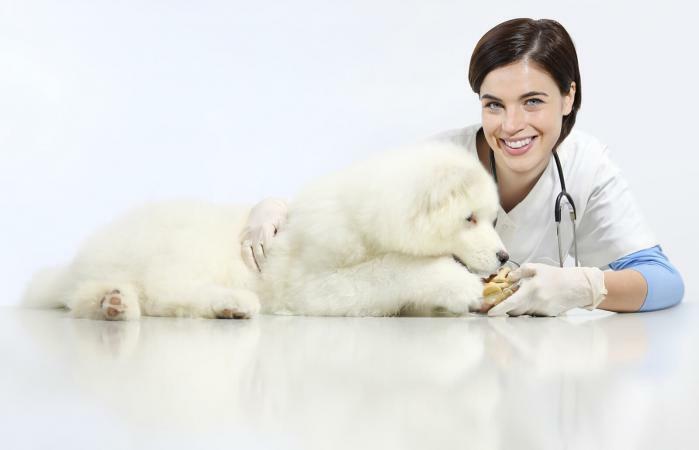 Your vet will recommend the treatment for your dog's condition. Part of the usual treatment for pancreatitis is a low-fat diet, where the total fat content is no more than 18 percent. This diet enables the pancreas to rest because the condition causes the pancreas to become overstimulated. Hill's Prescription Diet Canine i/d which is available for about $85 for a 27.5-pound bag and $3 for a can. Hill's Prescription Diet Canine w/d which is about $33 for a case of 12 cans and $40 for an 8.5-pound bag. Eukanuba Reduced Fat which is approximately $25 for a 15-pound bag. Royal Canin Veterinary Diet Canine Digestive Low Fat available for about $70 for a 28.6-pound bag and $65 for a case of 13 cans. If you decide to feed your dog homemade food, ask your vet about additional vitamin supplements. Very low-fat diets can be deficient in vitamins A and E.
Mix and add in a few drops of cold water until you have the dough. Roll onto a sheet for a 1/2 inch thick flat dough. Use a cookie cutter to make shapes or a glass for round cookies and bake at 350 degrees for 25 minutes. Depending on the severity of the condition, your dog may have to remain on the canine pancreatitis diet for the rest of her life to prevent a recurrence of the inflammation. It is very important that your dog not be fed table scraps or fatty foods. Your vet may also recommend feeding your dog four to eight very small meals a day. Small meals are less likely to overexcite the pancreas. Your dog will also be less likely to vomit after her meal. Dogs with pancreatitis can experience pain and discomfort. There are several options to try to comfort a dog with pancreatitis. Talk to your vet about dog pancreatitis treatment at home before you start. Talk to your vet about medications to alleviate his pain. If he vomits or has other digestive issues like diarrhea, your vet can prescribe drugs for this. Make sure he has access to fresh, clean water so he does not become dehydrated. The recovery time for a dog with pancreatitis varies with how bad his condition is. Severe cases can result in death if not treated right away. Research studies have found the dog pancreatitis death rate is approximately 40 percent. It's possible your dog may have to live with it for his whole life. Pancreatitis is treatable with a good diet and supportive care. Your dog will feel better as her condition improves, and so will you.